Lock in a great price for Mar Ipanema Hotel – rated 8.2 by recent guests! Close to the metro and to the beach. Very good breakfast. Extremely comfortable bed, excellent water pressure in shower, delicious breakfast, restaurant downstairs drew a good crowd during lunch and evening from outside of the hotel, great view of the lagoa & Christ statue from top floor terrace, near many good restaurants & shopping, a great book store "Livraraia da Travessa" and of course the best beach in Rio. Try "La Carioca" for great Peruvian ceviche just two blocks away, or "Venga" for Spanish tapas **must try the calamari**. Great price considering the location. Clean.. friendly staff. Nice breakfast included. Great location in the heart of Ipanema - two blocks from the beach, steps from many bars and restaurants, as well as lots of shopping options. Only the location. The hotel is on the main street and two blocks from the beach. we were on an upper floor so got a good amount of sunlight. Location. Near shops and markets. Good walking area. Good breakfast. Quite expensive for the room they offered - but it was Rock in Rio time so... It was an old one which was available. Location is amazing, of course, in one of the most famous streets of Ipanema! Staff was ok, quite nice. I didn´t like the food tho (room service). Staff was nice, breakfast good, and location can’t be beat. The breakfast was really tasty ( we love the juice selection ), the bed was good and the gym was good. The location of the hotel couldn't be better. In my opinion they could do something with the rooftop of the hotel. Mar Ipanema Hotel This rating is a reflection of how the property compares to the industry standard when it comes to price, facilities and services available. It's based on a self-evaluation by the property. Use this rating to help choose your stay! One of our top picks in Rio de Janeiro.Mar Ipanema Hotel is ideally located, just 350 feet from the world-famous Ipanema Beach. With modern design interiors, it offers a lively bar and restaurant, plus free WiFi. Rooms feature air conditioning, cable TV and mini-bar, while some also supply LCD TV, iPod dock or CD player. Providing soundproofed windows, they are decorated with contemporary paintings. There are plenty of dining and entertainment venues within walking distance, including Fórum Ipanema Shopping Mall. 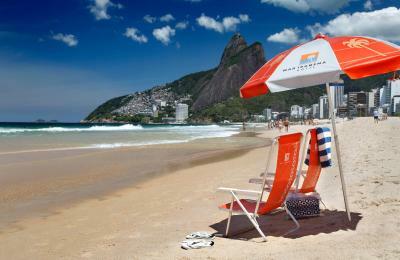 Mar Ipanema is located next to Copacabana Beach and Leblon district. Copacabana Fort is 1.6 mi from the Mar Ipanema Hotel while Lagoa Stadium is 1.1 mi away. Santos Dumont Airport is at a distance of 7.5 mi, while Galeão International Airport is 18 mi away. When would you like to stay at Mar Ipanema Hotel? This room is located between the second and third floor and features additional space, LCD TV and CD player. Only nonsmoking rooms are available. Please note that guests cannot bring visitors to the room. Private parking is available at a location nearby (reservation is not possible) and costs BRL 80 per day. Features LCD TV and iPod docking station. Only non-smoking rooms are available. Please specify before arrival if you prefer one double or 2 single beds. Guests cannot bring a visitor to the room. This room features air conditioning, mini-bar and soundproofing. House Rules Mar Ipanema Hotel takes special requests – add in the next step! Mar Ipanema Hotel accepts these cards and reserves the right to temporarily hold an amount prior to arrival. Please note that the hotel reserves the right to pre-authorize guest's credit card before arrival and the hotel will send a credit card authorization form when guests use a third person´s credit card to make the booking. When booking more than 5 rooms, different policies and additional supplements may apply. The hotel will request full payment upon reservation and it will be non refundable in case of changes or cancelations. Please inform Mar Ipanema Hotel of your expected arrival time in advance. You can use the Special Requests box when booking, or contact the property directly using the contact details in your confirmation. Staff on reception were not friendly or helpful WiFi didn’t work I booked a deluxe room and was given a family room. Just for me. Absolutely pointless. Nothing deluxe about my room or the service. Restaurant/Bar adjacent to hotel was extremely loud and noisy on the weekends until the wee hours. Even on the higher floors, it was hard to sleep or drown out the noise. Room was okay but mold in shower. The room was a bit noisy ( we could hear the cars on the street and sometimes you could hear noises coming from the wall that we thought that were coming from the pipes). The bathroom was not the best, but was ok. The hotel needs a reform as the facilities look a bit old, but even with all the comments above we had a pleasant stay. The Wi-Fi throughout the hotel is very poor. The location was perfect. Breakfast was amazing with a huge choice. None of the tv stations were in English. Restaurant staff are lovely. Location is ok. You could walk to Ipanema Beach. Good breakfast. Wi-Fi signal is really bad (not enough to load a webpage in) or not working, In the pictures the roof top terrace looks much bigger and the view from the terrace is different in the reality than in the pictures, not so spectacular. Clean and nice rooms, enough big, huge bathroom. Nice breakfast. Pato is one of the best restaurant in the city which is located in the hotel ground floor. small room with bad smell, totally different from the photos, the terrace completely abandoned with bar closed. the breakfast and the professionalism of the staff. We booked a superior room but it was a lot smaller than the pictures we seen. The location is perfect. It's the best part of Rio to stay in with great shops, bars and restaurant nearby. The hotel's own lounge bar is very popular especially at the weekends where you will be lucky to get a table or seat. It's a two minute walk to the beach.